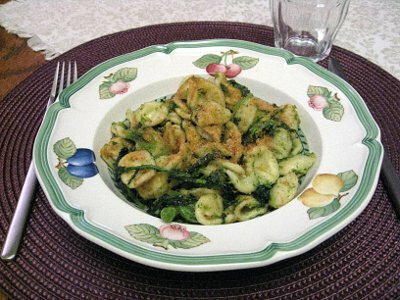 This is a typical recipe from Puglia and is among my favorite pasta recipes. A part from the boring part of cleaning the Cime di Rapa (Broccoli Rabe) it is very easy to prepare. The secrets are to boil the orecchiette in the same water where you boiled the Cime di Rapa, and to add some toasted bread crumbs. These quantities will make enough for 3 people or 2 hungry ones! 1. Clean the Cime di Rapa. First of all clean the Cime di Rapa, keep only the smaller and more tender leaves and discard the harder parts of the stem. Wash the cleaned Cime di Rapa in abundant fresh water. 2. Boil the Cime di Rapa. Bring the water to boil in a pasta pot. When the water boils add salt and then the Cime di Rapa and cook for about 5 minutes or until the stems are tender ( I usually check them with a fork). When ready take the greens out of the water, but leave the water in the pot because it will be used to cook the orecchiette. 3. Toast the bread crumbs. 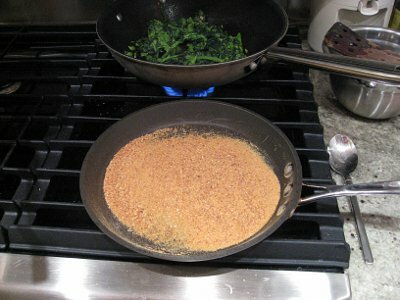 While the greens are boiling, toast a few Tbsp of bread crumbs in a heavy non stick pan. Stir often and toast until golden brown. 4. Boil the Orecchiette. Bring the water of the Cime di Rapa back to boil and then add the orecchiette. Coock them al dente! 5. Stir fry the Cime di Rapa. 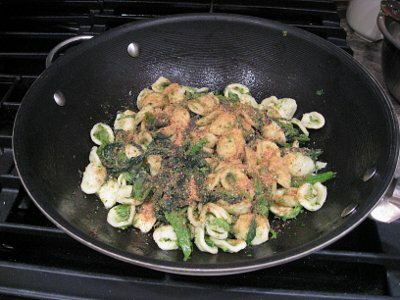 While the orecchiette are boiling, heat some extra virgin olive oil in a wok or large pan. When the oil is hot add the cleaned garlic cloves halved or crushed, and some pieces of hot chili pepper. Fry a bit and then add the Cime di Rapa. Cook the cime di rapa for 5 or 6 minutes adding a few spoons of their cooking water. Remove and discard the garlic. When the orecchiette are ready and al dente, drain them and add them into the wok with the Cime di Rapa. Let blend the flavour on a medium flame. At the end add the toasted bread crumbs. Serve right away. Sprinkle some more toasted bread crumbs on each serving and some extra virgin olive oil if needed.